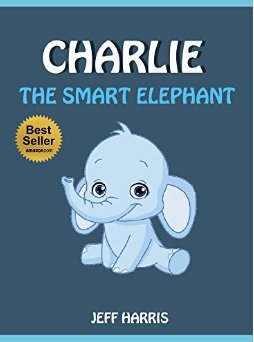 Short tale of less than twenty pages featuring Charlie the Elephant, an intelligent but hungry elephant who was born in a small town somewhere in Africa, but who longs to live the life of a pet in a cozy family. One day he is adopted and placed in a stray animal shelter where Charlie finds the company of other animals. He is delighted when a boy named Connor adopts him; and the family builds a separate house for the elephant. Then Charlie becomes sad because he has everything he needs and is bored. Charlie rejoices when he overhears two pet dogs talking about their cookies being missing. So Charlie decides to become a detective and solve the missing cookie mystery. Following the cookie crumbs, Charlie comes to a deep forest. Should he enter the forest and risk becoming lost? Will he solve the mystery and return to his family? This book is charming and sweet for a bedtime story, and beginning readers will be able to handle the text, but the plot does not always flow smoothly or connect the dots. Children might have questions that go unanswered. A few simple illustrations are included. Targeted for readers ages two through fourteen, I would recommend it as a bedtime story for preschoolers or as a beginning reader for a child who enjoys stories about pets.